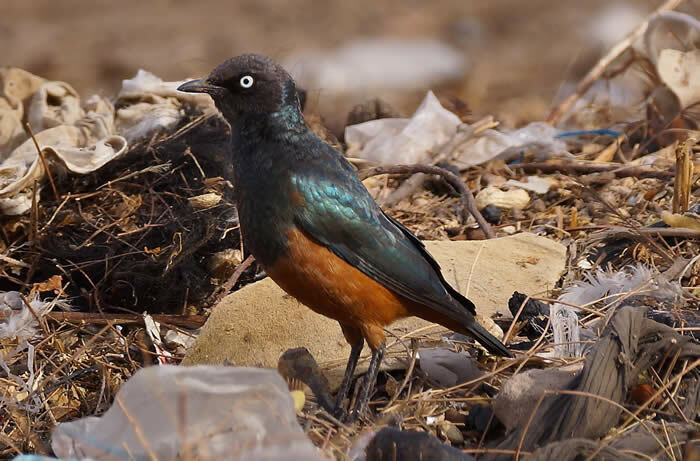 This tiny, friendly West African gem has long been a favourite with birders, and with good reason. 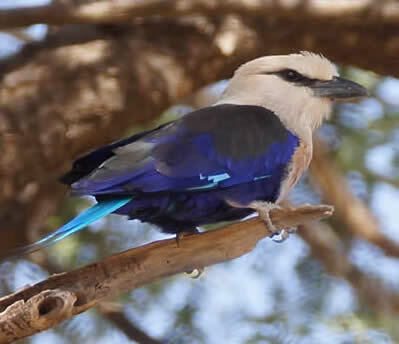 As the gleaming Gambia River bends gently inland to form its welcoming ‘grin’, it provides access to teeming habitats ranging from coastal creeks to mangrove swamps to freshwater lakes, with species-rich Sahelian scrubland in between. 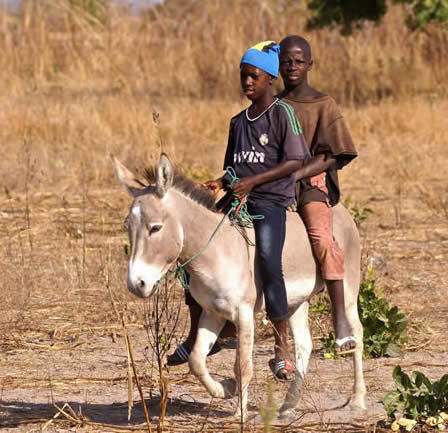 Occupying about the area of Norfolk and Suffolk combined, this small, accessible country embraces the shores of the languid Gambia River, which flows through its very heart before emptying into the Atlantic Ocean. Extensive protected areas interspersed with low-key traditional agriculture make for a welcoming wildlife haven, rich in eye-poppingly colourful flora and fauna. 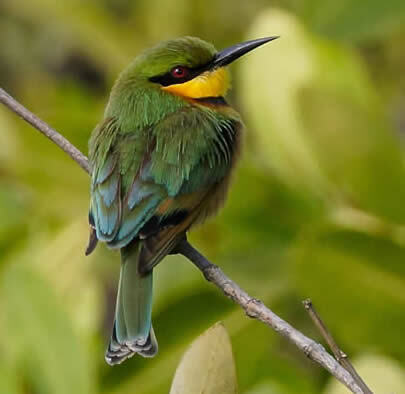 Appealing, hospitable and easy to visit, this simply amazing birding destination provides an ideal introduction to sub-Saharan Africa, with raptors galore and a myriad of colourful and exciting target species. Bursting with life and culture, it is well-deserving of its nickname of ‘Africa’s Smiling Coast’, not just for its geographical appearance, but also because of the genuinely warm welcome waiting for you here. 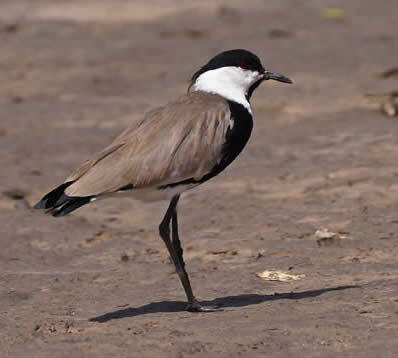 Tanji Bird Reserve is made up of mangroves, dry woodland, vegetated dunes and coastal lagoons. With this range of habitats it’s no wonder that over 300 bird species have been recorded here. Exploring from our eco-lodge accommodation within the park, we’ll hope to see black-headed heron, white-fronted plover, Caspian and royal tern, and grey-headed and slender-billed gulls. 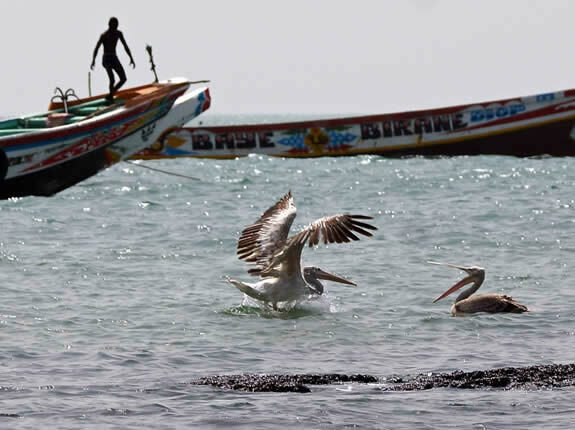 The coastal town of Tanji offers culture and wildlife spectacles combined, with superb up-close views of sea- and shore-birds fighting over fish discards at the lively local fish market, where fisherman barter loudly over the catch of the day from their colourfully-painted wooden fishing boats. 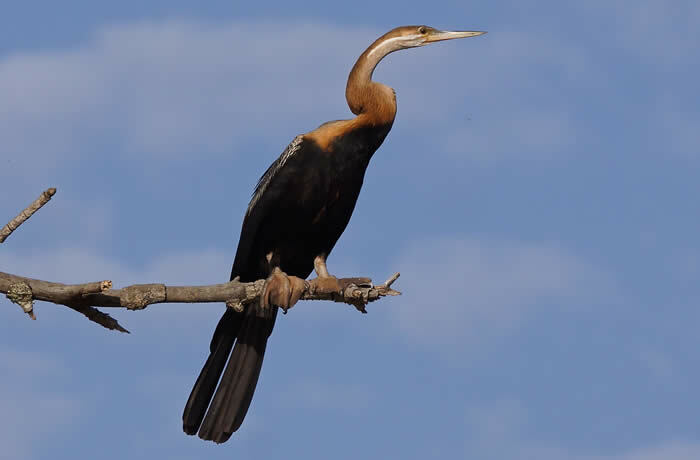 Tiny Abuko Nature Reserve was The Gambia’s first protected area and is a veritable treasure chest of natural riches. Among the oil palms and Anthocleista, hardwoods such as mahogany and African teak remain unharmed. 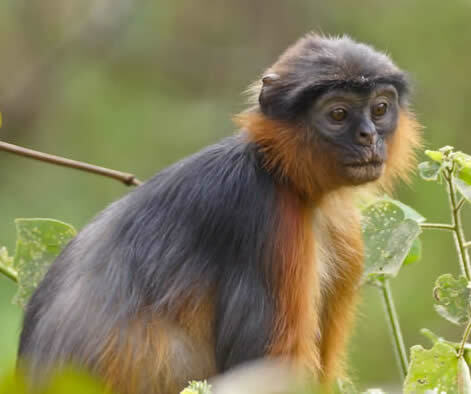 Among them live vervet, red colobus and patas monkeys, not to mention a stunning array of birds such as green and violet turacoes, African paradise flycatchers, palm nut vultures and giant kingfishers. In the pools lurk Nile and dwarf crocodiles. The dense red and black mangrove swamps and mollusc-rich muddy banks of the Bao Bolong River are protected under the Ramsar convention from the northern border of The Gambia right to its scenic estuarine culmination where it joins the Gambia River. From our base at Tendaba Safari camp on the opposite shore, we will explore the reserve’s mysterious steamy creeks by boat, getting us up close to avian A-listers such as African finfoot, African blue flycatcher, malachite, pied and blue-breasted kingfishers, goliath heron, African darter and spur-winged lapwing as well as experiencing the prehistoric sounds (and smells!) of egret and cormorant colonies. 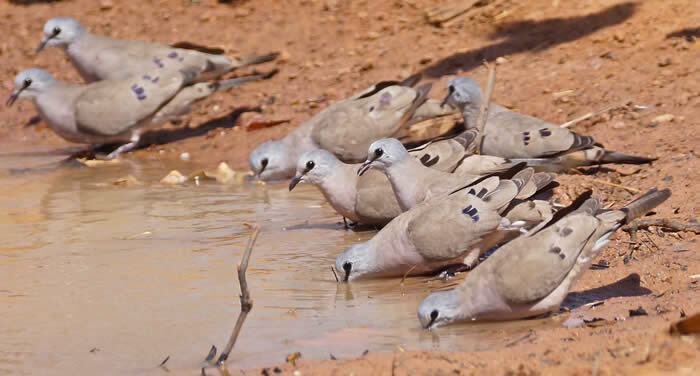 Hides around the watering holes of Kiang West National Park will bring us up to close to laughing doves, speckled wood doves and maybe even wintering European turtle doves. They can also bring views of some of the park’s mammalian residents such as bushbucks, warthogs, and with extreme luck some of the parks reclusive wild cats such as serval or caracal. 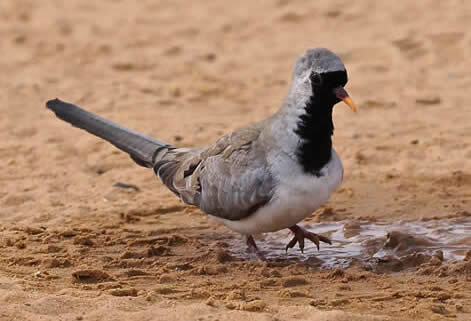 Further inland, amongst Sahelian scrub and savannah grasslands, we’ll meet a whole host of other bird species. Flowering and fruiting trees, such as Pterocarpus erinaceus, red acacia and the iconic baobab, provide a real focal point for wildlife. 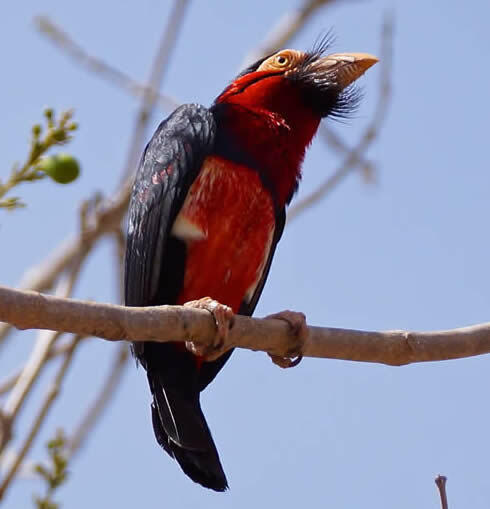 Here we’ll look for bearded barbet, exclamatory paradise whyda, white-fronted black-chat, white-throated, little, blue-cheeked, red-throated and northern carmine bee-eaters. We’ll also search for the enigmatic Abyssinian ground hornbill, one of the most long-lived of all birds. At dusk we may be lucky enough to see Senegal thick-knees and long-tailed and standard-winged nightjars. For lovers of raptors, simply looking up will bring a constant stream of delights. The diversity of raptor species in The Gambia is truly phenomenal, with over sixty birds of prey including spectacular creatures like bateleur, dark chanting goshawk, shikra, African harrier hawk, Verreaux’s eagle owl, and Pel’s fishing owl to name just a few. 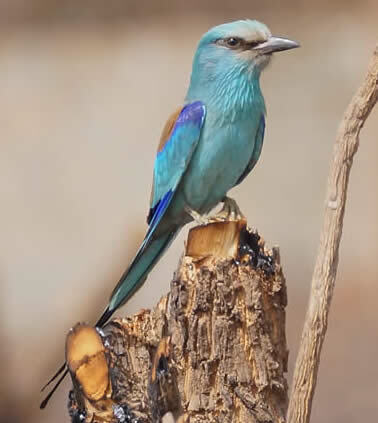 Blue-bellied roller; black-billed wood doves. 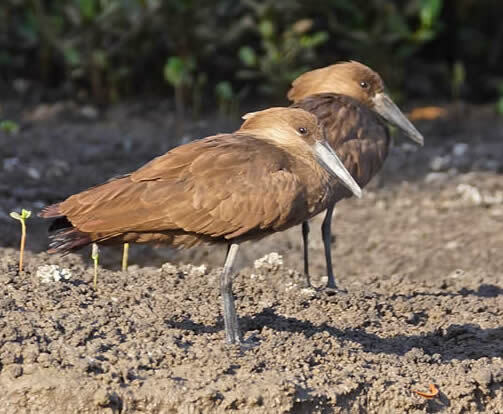 Based at Kotu Creek, near Brufut, the Gambia Bird Watchers' Association was established in 2007. It provides a headquarters for the area's bird guides, trains the next generation of ornithologists. 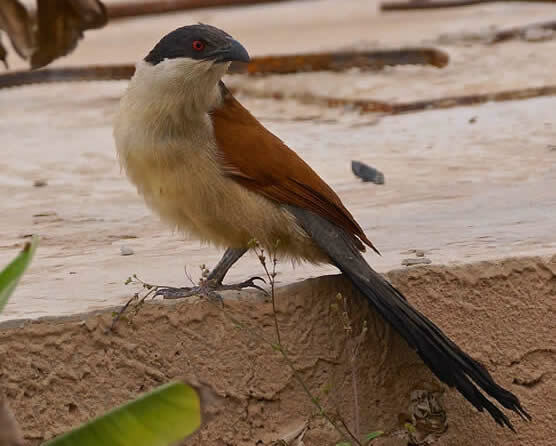 In The Gambia, many important forests are still community-owned, and BWA is instrumental in setting up community reserves, training bird guides in the villages and enabling them to benefit from the preservation of forest habitat through ecotourism. 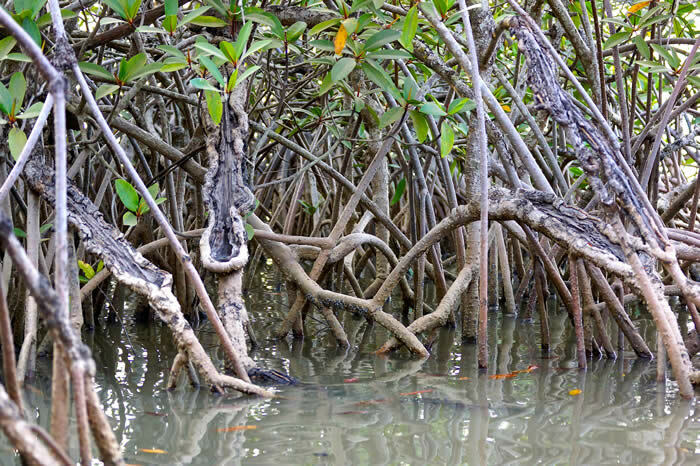 Mangrove: extraordinary intertidal woodland. BWA carries out excellent project-based conservation work, including using local volunteers in the restoration of mangrove swamp habitat. Price: £2,600 per person in twin or double room for ten nights (Monday to Thursday). Flights: Scheduled Thomas Cook Flights direct flights London Gatwick to Banjul. 3 Dec: MT1170 depart London Gatwick 07:35, arrive Banjul 13:35. Simon Tonkin worked as an RSPB Senior Conservation Officer for many years, specialising in the challenging job of stopping the decline of farmland wildlife. 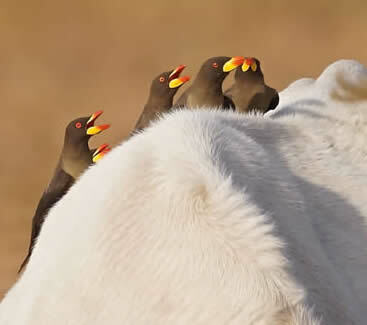 He also lectures in ornithology and has been involved in developing ‘fair to nature’ food products. Niki Williamson was a warden at the RSPB’s Ouse Washes nature reserve, then worked on projects helping farmland birds in the Fens and subsequently managed the RSPB Eastern England’s farm wildlife advisory team. 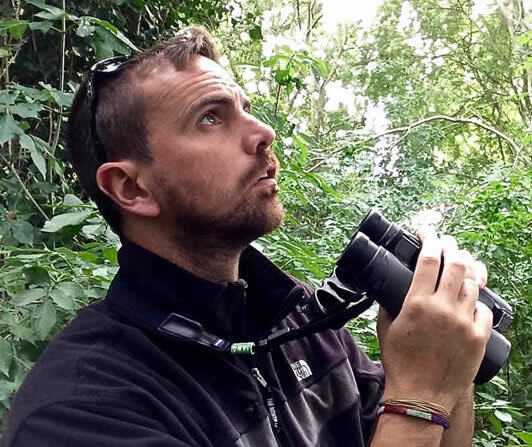 Both are now full-time nature guides, based in the Strait of Gibraltar and specialising in leading tours all along the East Atlantic Flyway. 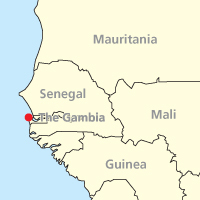 FCO travel advice for Gambia here, and NHS health advice here. Gambia 2018 holiday report here. Honeyguider Brennan Aunger's photos from December 2018 on Facebook here. Sahel: no website for Janjanbureh area. Photos on this page by Simon Tonkin.